Seasoned horse racing betting punters might want to look away now, but with the bulk Grand National bets, each year being placed by ‘once-a-year’ punters then placing a simple wager can still be a daunting prospect. But, don’t worry, there is good news. Grand National Betting odds are in your favour once you get a handle on each-way betting with our Grand National Each way betting guide for 2019. Grand National Each way betting is the most popular form of betting, accounting for around 75% of all bets placed at Aintree. Long gone are the days of the smoke-filled betting offices with intimidating punters lurking inside and now the fresh and friendly high street bookmakers are happy to help, whether you are a pro or a novice Grand National better. Each April the ‘once-a-year’ bettors come out of the woodwork to place their annual Grand National bet, but with plenty of help, it’s a lot easier betting on the world’s greatest steeplechase these than it used to be. High street bookmakers, like Unibet and William Hill, will draft in extra staff to help, while with online betting at an all-time high then you don’t even have to leave the house to place a bet on the 2019 Grand National! Most punters will just want to pick out a horse to win the Grand National and then simply place a set stake on that horse crossing the line before all the others do. However, the next step up from a ‘win-only’ option is the popular GRAND NATIONAL EACH WAY BETTING. In simple terms, it’s a bet that is split into two. The first part of your bet will go on your horse to WIN the Grand National and the other part will go on the horse to be PLACED in the race (more on what placed means below). The two bets are always of equal stakes – £5 on the win and £5 on the place. Why choose Grand National Each Way betting over Simple Win Betting? 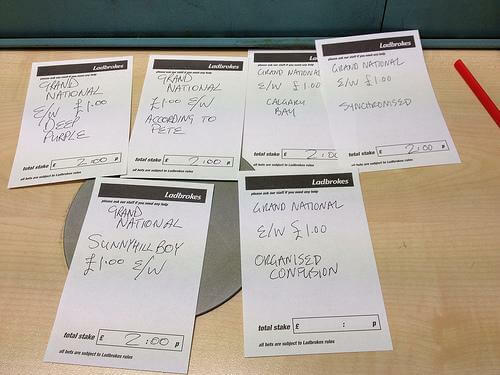 Think of Grand National each way betting as a bit of an insurance bet. However, in a race like the Grand National with 40 horses, plus 30 unique fences to jump, you might have by far the best horse in the race but it’s still got to get around and get through the 4+ miles safely. If – for example – you have £20 to spend on your Grand National bet you will win more if you are just placing the full £20 on the horse to win. But, but if you are placing £10 a Grand National Each way bet (total stake £20), you won’t win as much for the horse winning, but you will be safe in the knowledge that if the horse is pipped on the line to be 2nd, or runs on to take 3rd or 4th then you’ll still be paid out – ‘insurance bet’. You won’t get that with a simple win bet. Don’t forget an each-way bet is made up of two parts so when working out any each-way bet this same principle applies. Did my horse finish 2nd 3rd or 4th? If the answer to both questions is ‘YES’ then you’ve clearly just backed the winner of the 2019 Grand National and you are in line to be paid out on both parts of your each-way bet. If the answer is yes to the second question – did my horse finish 2nd, 3rd or 4th? – then you’ve won your place part of your each-way bet and will be paid out at ¼ the odds. These odds will either be what you decided to take at the time you placed the bet or if you ‘let the bet ride’ it will be settled at the industry SP odds at which the horse won. Note: Just to confuse you a bit here – a lot of bookmakers will add in special ‘extra places’ on the day. So, for example, if your horse finishes 5th or 6th you might still get paid out (more on Grand National bookmaker special offers below). If you’ve placed your Grand National bet online then you’ve nothing much to worry about at the bookmakers will work out the bets for you. Yes, they will also do this in the shop, but as it’s a busy day for betting shop staff it’s always advised to know what your returns are before accepting your winning cash off them after the race. These mistakes mainly surround the staking as novice punters may not be aware that an each-way bet is, in fact, TWO BETS – therefore, your stake (whatever you decide that is going to be) needs to also be doubled. For example, A £10 EACH-WAY BET ON A GRAND NATIONAL HORSE WILL COST YOU £20 IN TOTAL (£10 for the win part of the bet, £10 for the horse to be placed). Another common mistake, if you are placing a bet in a shop, is to make sure you write ‘each-way’ or ‘E/W’ next to the name of the horse you are betting on. Or, if you are betting on the Grand National online then when placing your bet this way will always require you select an e/w button or box to tick. The good news online though is that your total stake will be worked out for you should you tick the ‘each-way’ button. 16 or more Runners: A 1/4 the odds over 4 places (1st, 2nd, 3rd and 4th place) – This means that because the race has 16+ runners and the type of race is a handicap then all UK bookmakers have to pay their customers on the place part of the bet at ¼ the odds and for places 1st, 2nd, 3rd & 4th. In a nutshell – the horse you are betting on in the 2019 Grand National needs to finish in the top 4 in order for you to win something! Will Bookmakers Offer Extra Each-Way Places? Yes, a lot will. We touched on this earlier and with competition as strong as ever to get your custom then always shop around for extra places. As mentioned the standard industry place terms for the Grand National (providing there are 16+ runners) is set at 4 places, but a lot of the main bookmakers like Unibet, William Hill, Paddy Power and Betfred well entice customers in by offering extra places. Some bookmakers have even been known to offer places right down to 7th and 8th in the past so be sure to hunt around for the best offer. All we would say is that those bookmakers that might be offering extra places on top of the standard 1-2-3-4 may well compensate this my offering slightly worse odds on the race so take this into account. Yes, you might be getting 1-2-3-4-5 places, but that might be sacrificed by having to back a horse at 10/1 that is 14/1 elsewhere. Which Grand National Horses Should I Bet Each-way On? With the betting on the Grand National each year always extremely competitive then punters should shop around and get value betting odds. The general rule with Grand National each way betting is that because the place part of an each-way bet is ¼ of the winning odds, the benchmark price to bet each-way is around 4/1 or higher. Anything lower than 4/1 and unless the horse wins you’ll actually return a loss on your overall stake. But the good news about the Grand National is that it’s extremely rare for horses to be priced-up in the betting market at 4/1 or shorter. Even the favourites in the race are generally around 8/1-10/1, while in 2009 we even saw a 100/1 winner of the Grand National – a ¼ of 100/1 is still a tasty 25/1 so even the place part of this bet for punters saw a mega return. Grand National Each Way Betting Guide What is Each Way Betting? Why choose Grand National Each Way betting over Simple Win Betting? Grand National Each way Betting Example Grand National Each way Betting Rules Will Bookmakers Offer Extra Each-Way Places? Which Grand National Horses Should I Bet Each-way On?